Setting aside the fact that O.J. Simpson’s participation now interferes with—rather than enhances—its humor, The Naked Gun 2 ½: The Smell Of Fear remains that oh-so-rare comedy sequel to equal, if not surpass, its illustrious predecessor. A masterpiece of farcical absurdity—labeled in its credit sequence “Un Film De David Zucker”—picks up with Police Squad’s bumbling Frank Drebin (Leslie Nielsen) on the trail of Quentin Hapsburg (Robert Goulet), a villain in league with the oil, coal, and nuclear power industries. Hapsburg plans to sabotage Dr. Albert Meinheimer’s (Richard Griffiths) recommendation to President Bush for clean renewable energy by replacing the expert with a body double—a plot almost as dastardly to Drebin as Hapsburg’s romancing of his beloved Jane (Priscilla Presley). 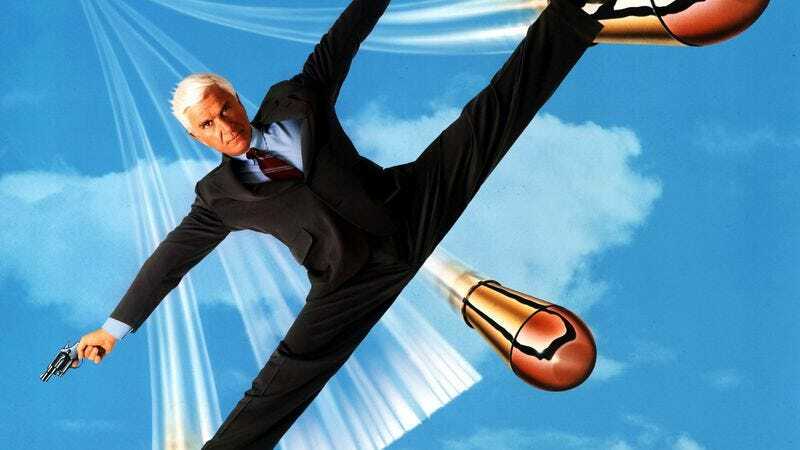 Yet anyone familiar with the Naked Gun franchise knows that said storyline is merely a flimsy vehicle for all manner of lunacy, which here takes the form of pratfalls, visual gags, non-sequiturs, and Drebin’s trademark cluelessness. Whether attempting to drink a cocktail overflowing with decorative umbrellas and fruits to fleeing Dobermans across rooftops, riding upside-down and face-to-crotch on another man’s wheelchair, or simply delivering one of innumerable ridiculous one-liners (“You’re part of a dying breed, Hapsburg. Like people who can name all 50 states.”), Nielsen is at the absolute top of his buffoonish game in 2 ½. There are so many classic Drebin retorts in this phenomenally funny sequel that it hardly matters that, two decades later, some of its more “timely” gags—the bookending Barbara Bush-centric embarrassments, the pottery-wheel Ghost parody—have aged. Dated Geraldo Rivera punchlines aside, Zucker’s comedy is still a sharply written and hilariously performed feature-length goof, one that moves so swiftly and seamlessly between nominal narrative nonsense and completely out-of-left-field jokes that it makes the entire process look effortless—or at least as easy as thwarting a nuclear bomb by simply pulling its plug. Availability: The Naked Gun 2 1/2 is available to stream via Netflix, and to purchase on DVD, by itself or as part of a cheapie four-film set with the other Naked Gun titles (and the Fugitive parody Wrongfully Accused).